One little three-wheeled car is zooming ahead to the future, with an outrageously efficient electric engine that rates a staggering 26,135 mile per gallon equivalent (MPGe). The TUfast eLi14, created by a team from Germany’s Technical University of Munich, is not only the first car in the world to achieve such a high efficiency rating, but its MPGe rating is also more than 200 times as efficient as the average electric car on the market. Although the TUfast eLi14 isn’t designed as a daily commuter, the technologies used to achieve its record-breaking efficiency could someday be applied to mass market cars, leading to a world with a lot less fossil fuels. The efficient little speedster was originally developed two years ago to compete in the Shell Eco Marathon. Like many experimental vehicles, the finish line of that race was far from the end of development for the TUfast eLi14. 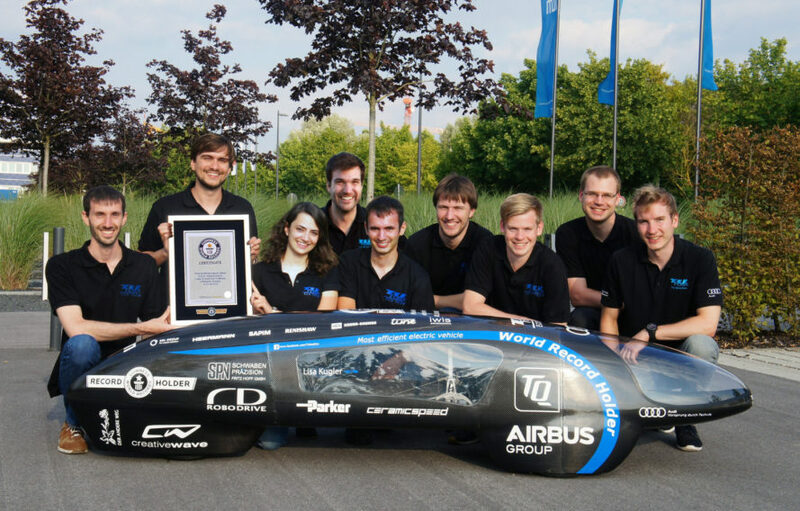 The students and graduates who created the electric car, who call themselves the TUfast Eco Team, continued to work on the tiny racer, upgrading its motor, coils, and wheels until it was efficient enough to score the Guinness World Record for Most Efficient Electric Vehicle. The record was awarded July 16. The TUfast eLi14 is a low-riding bullet of a car, with room for just one person inside its teardrop-shaped body. Because the vehicle was designed to maximize efficiency, the driver must lie down to operate the EV, resulting in a super compact ride with little wind resistance. Riding on three wheels for maximum stability, the EV underwent several runs at Audi’s test track with upgrades in between. The car finally achieved an energy use of 1,232 km/kWh (765.53 mi/kWh), which converts to the equivalent of 26,135 MPG. A Toyota Prius, by comparison, gets a measly 120 MPGe. This means the TUfast eLi14 could theoretically travel as far as 6,808 miles on a single liter of premium unleaded gasoline. Talk about an epic road trip. A team from Germany's Technical University of Munich developed an electric vehicle that recently rated the equivalent of 26,135 miles per gallon.